I suppose I could have just pulled out one of the self-patterning yarns in my stash and done a stockinette sock, or else dragged out one of the other sock works-in-progress, but instead, flush on the heels of zipping through Mosaic Marbles, I decided I wanted to do a little more colorwork. Also I decided I’d be nice and make a pair for Richard, since the last one didn’t turn out so well. So over the weekend (when I wasn’t processing a gazillion tomatoes into sauce, because it’s that time of year here in the Central Valley) I started and ripped out the first of a pair of socks, too many times to count. And then eventually I gave up because the yarn I was using was on the thin side and even 80 stitches around was too small and it looked like in order for them to fit, I might even have to go up to 100 stitches. 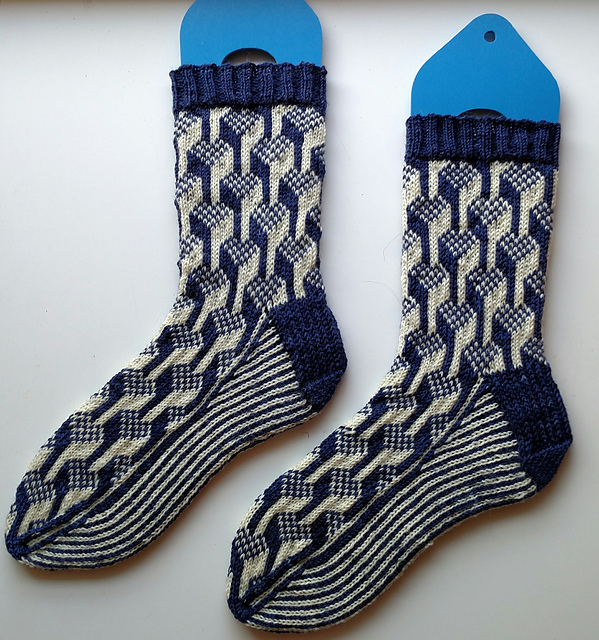 I’m sorry, but life is too short to be knitting socks with that many stitches on the needles, so instead of turning the yarn into socks for Richard I decided that they were destined to be something else, and I cast on for these. The more I knit them the more I loved them and wanted to just keep on knitting them, and before I knew it, they were done. I have loved this motif since I stumbled across it, many years ago, probably in a stitch pattern book somewhere. I like how it looks if you do it just in one color with knits and purls, but I love it the most when there are two colors in the mix, and suddenly there is this 3-D effect. It’s stranded, which is the perfect way to use thin yarn without ending up with a sock that’s much too thick to be practical (I do live in California, after all, where one doesn’t actually really need warm socks most of the year, unless one happens to work in an office where they routinely set the AC to ‘arctic’). I just did my usual ribbed cuff and heel flap and single-stitch stripes on the bottom of the foot, and I decreased the toe while still keeping the pattern going until almost the very end. I am quite pleased with the result. However, I don’t think this is the end of it. As much as I like *these* socks, they’re missing something. I feel like there needs to be a better way to have the pattern flow organically, from cuff to heel to toe, without those solid blocks of color. So I’ll definitely be doing more work with this motif in the future.